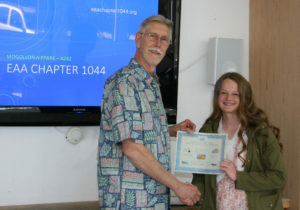 EAA Chapter 1044 was pleased to present its 2018 Air Academy Scholarship to Julia Reidhead this past Saturday at its monthly Chapter Get-Together. Julia is a junior at Mogollon High School. 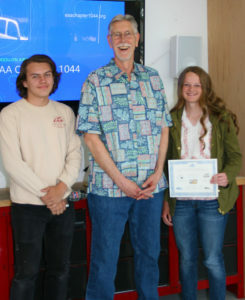 Both Julia and Matthew Robinson, 2017 recipient and also a junior at Mogollon High School, will be attending EAA’s Air Academy in late July. EAA Air Academy is a series of week-long camps designed to introduce young people to the aviation world. Campers are engaged through a variety of hands-on activities while staying at the EAA Air Academy Lodge located on Wittman Field in Oshkosh, Wisconsin. Experienced aviation instructors help them delve into flight through actual flight instruction in an airplane and helicopter, hands-on building and maintenance procedures, flight simulation, and other exciting activities. Air Academy provides the foundation for a lifelong love of aviation. This is the third year the Chapter has offered this scholarship. 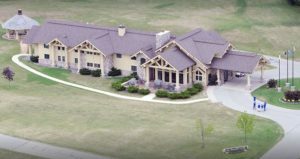 Once again, this scholarship will cover all expenses (tuition, airfare and shuttles to/from camp, lodging and meals) to send deserving youth from the Heber-Overgaard area to the summer aviation camp. In addition to all the Air Academy activities, attendees will have the opportunity to experience EAA AirVenture, the World’s Greatest Aviation Celebration, with over 10,000 airplanes, 1,000 forums and forums, airshows each day, 900 exhibitors, and hundreds of thousands of aviation enthusiasts. This entry was posted in Latest News... by LDriver. Bookmark the permalink.